fIf you are reading this article then you must be an inflatable paddle board owner and that’s already an accomplishment. Indeed, it is one thing to do paddle boarding and another to go for an inflatable board. Inflatable paddle boards are revolutionary in every meaning of the word; they are convenient, space saving, easy to transport and handle, light, robust and come at reasonable prices. Nevertheless, there is a little inconvenience that all of us suffer from in the beginning and that is pumping the darn thing. This isn’t an individual case, all inflatable paddle board owners will get to a point where we just won’t have it in us to manually pump our 10 to 14 feet large board. So, what’s the solution you might wonder? Well, isn’t it obvious? You need a SUP electric pump! You might be okay with manual pumping for now but at some points it just gets so demanding and time consuming, especially for people who often go out paddling. So, we end up avoiding deflating our boards to save up on time and labor the next time we use it. So, without further a due, we took it as our duty to dig out the best air pump for inflatables on the market and we discovered a few options that you might actually like. The BTP Mano is an exemplary electric SUP pump which is why we decided to put it up first on this list. It’s one of the best SUP electric pump out there. It’s a two stage turbo pump which is great for kayaks, boats and down to boards. From a stage one low pressure high volume turbine blower, the BTP can go easily go up to a stage 2 high pressure piston for higher PSI aka big boards. The pump is thus powerful enough to completely inflate your paddle board in a couple of minutes. 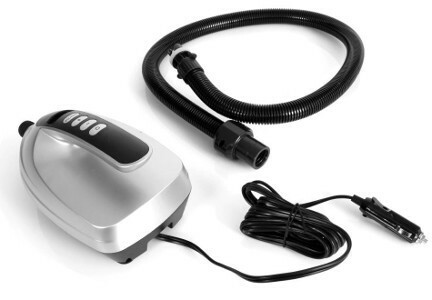 For features, the pump at hand comes with a 102 inches cable with alligator clips to run it from your car or any external battery, 72 inches inflation hose with common valve adapters and a 12 volt battery (not included). On the down side, the pump at hand is not capable of plugging to wall outlets or your car’s cigarette lighter. Hence, the BTP Mano is still a great electric pump for paddle board as it is efficient, powerful and comes with an automatic stopper which stops at the PSI level you chose. So, if you could disregard the little shortage on outlet flexibility then you’re hooked for life as this pump will come in handy every time you need to pump something that requires a lot of pressure and not just your paddle board. The Bravo BP12 is an excellent electric SUP pump and that is a decision reached by the buyers themselves. Indeed, this is a pump that has accumulated a clean 4 stars rating on Amazon which indicates that a lot of people are satisfied by this pump. But why? Well, the Bravo at hand is rather less complex than the previously reviewed pump as it is a single stage Bravo sup pump, meaning that it functions efficiently continuously. Further, the pump has got a lot more to show for being a portable, light weight and compact high pressure piston pump but it still isn’t perfect. The Bravo BP12 comes with 102 inches cable for alligator clips to run it off your car’s battery but it can’t be plugged to the wall or your car’s cigarette lighter. Nonetheless, this Bravo still comes with a 72 inches inflation hose that is enough for most cases and a a valve adapter to fit pretty much every paddle board, kayak or boat that you own. 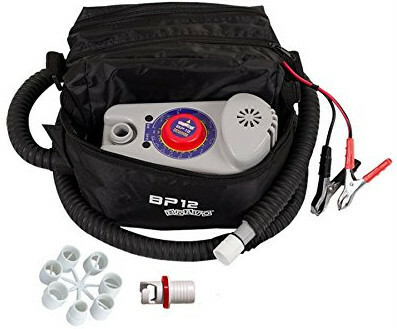 Hence, the Bravo BP12 is considerably affordable and impressively powerful as it can inflate from 1 to 15 PSI in a few minutes and that’s the main reason why we need an iSUP electric pump anyway. Unlike most pumps on this list, the one at hand is actually made by an inflatable paddle board manufacturer and a very reputable one as well. Tower is a prominent brand in the industry of inflatable paddle boards and it’s about time they handed us THE pump we need. Accordingly, the Tower pump is made with a paddle board owner in mind and unlike most powerful electric pumps, this one is actually pretty clean. Indeed, the Tower pump comes with minimum cabling because it doesn’t require alligator clips. Instead, you can plug it directly into your car’s 12V cigarette lighter and it will work just fine. Further, beyond being compatible, light weight and convenient, the Tower electric pump is actually pretty robust. Hence, you don’t really have to worry about baby handling it because it can actually take the friction. Moreover, the pump at hand might be modern but it is still capable of hard labor as it can inflate the largest Tower paddle board in a matter of minutes. This is due to the high pressure piston it harbors and its ability to continuously pump at the same level. 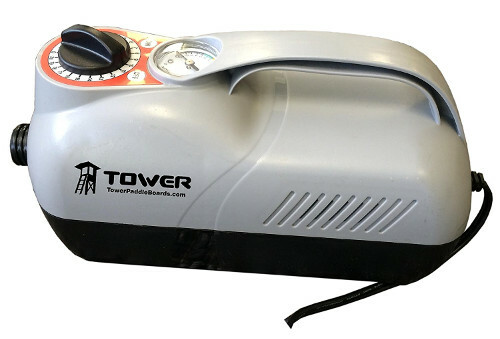 Hence, the Tower pump can indeed be used with every Tower paddle board but it can still be used for most inflatable paddle boards out there and even if that’s not the case then you can get yourself a valve adapter for a few bucks, making this probably the best electric air pump for inflatables. The Seamax is a SUP electric pump which is made out of marine grade material, making it especially compatible with iSUPs. Nevertheless, to achieve a mentionable stance, an electric pump requires more than just a compatible body. Accordingly, the Seamax is a solid performer as well because of its single stage pumping, ABS and Nylon base. So, once you turn this thing on, you should be getting enough power to pump up a 15 PSI board in a few minutes as it reaches high pressure performance pretty quick. In terms of accessories, the Seamax isn’t that much of a tidy machine since it comes with a bunch of necessary cables. In that respect, the pump comes with a reinforced 4.5ft air hose which is the perfect size for pumping, 360 degree free turning main air hose connector, screw-in style adaptors provide perfect air tight for a variety of boards and a set of alligator clips for the 12V battery. Unfortunately, the Seamax doesn’t plug to a wall outlet or a car’s cigarette lighter but it does have a digital pressure LCD to keep you in check. Also, the machine can be set to stop automatically at a specific PSI level which would allow you to go on multitasking while your board getting ready. 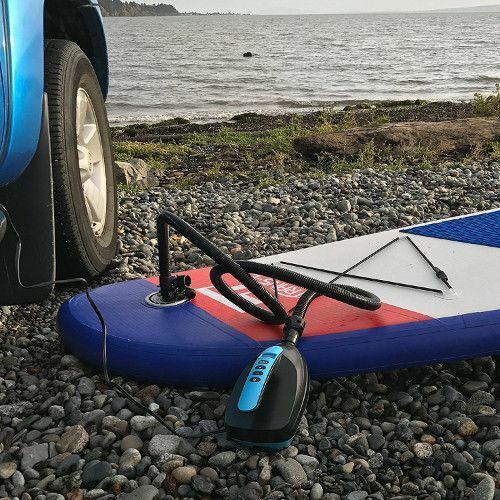 Hence, the Seamax might not be the best inflatable sup pump but it is still made in Canada which does say a lot about its quality and that makes this machine pretty trust worthy. There are a few electric pumps out there that can compete with the SereneLife premium in both performance and price tag. Indeed, the SereneLife at hand might just be the best sup pump and here’s why. First things first, the pump’s main quality is the fact that it’s labelled an intelligent machine. Hence, the Premium pump offers an adjustable PSI air pressure with an LCD that shows your preset pressure selection. The pump also can be set to shut off automatically once it reaches the preset PSI. 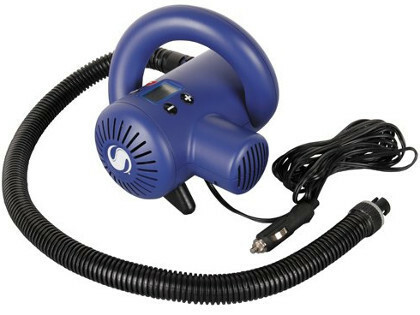 As far as extensions, the SereneLife comes with a detachable 3.3’ft heavy duty accordion style air hose. Also, it comes with a high pressure valve fitting for reliable high pressure use. Lastly, the package also includes a 12V DC car vehicle connection. From practicality to design, the machine at hand can be easily described as compact & portable. Nonetheless, the SereneLife is much more than just that. The pump does not only inflate your board but it also deflates it with a touch of a button. Lastly, the difference between this pump and most electric ones is that the SereneLife is a pump made by an iSUP manufacturer, giving it the upper hand in the most obvious way. So, what do you say? Like most 12V electric SUP pumps, the Sevylor does a great job at removing the labor out of the pumping operation. However, it is undeniable that some electric pumps do the job better than others. So, where does that place the Sevylor? The pump at hand is a full on single stage electric pump. 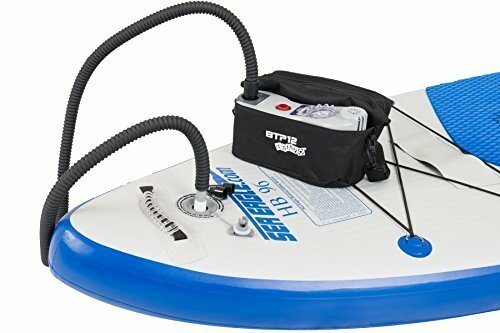 Hence, unlike most pumps within its price range, this one is capable of completely inflating a 15 PSI board, kayak or boat in a matter of minutes. Obviously, the pump can get the job done faster than doing it manually but you shouldn’t be expecting supersonic speed either. The Sevylor might not be the best electric sup pump but it still features an adjustable auto shutoff setting that stops the pump at a selected pressure, allowing you to do other things besides watching over the pumping process. Also, surprisingly enough, this machine actually comes with a 12V car cigarette lighter plug which will enable you to easily use your car to power it instead of constantly fetching new batteries or having to open up your hood in the case of alligator clips. In extensions, the pump comes with a low pressure robust extension hose and an adaptor whose purpose is to make sure the hose fits most iSUPs out there. All in all, the Sevylor remains a solid SUP electric pump as it is designed by an iSUP manufacturer and that already puts it at an advantage. So, is this the pump you’ll go with?